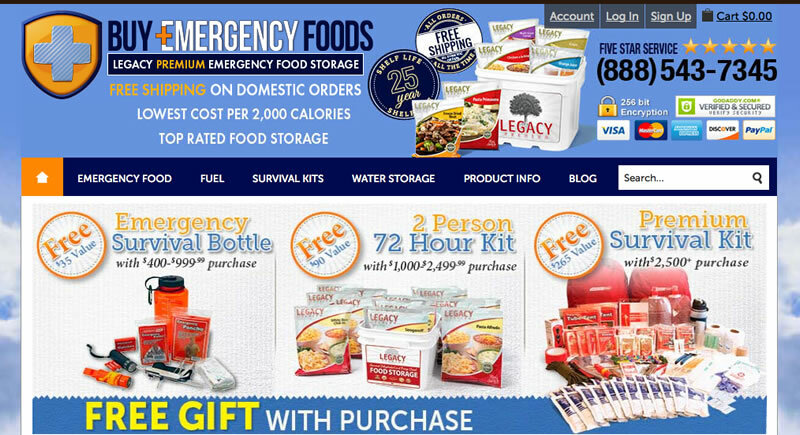 Long-term emergency food supplies prepare your family for a disaster that lasts. A typical power outage, even one that is lengthy in nature, usually will not last more than a week or 10 days. The typical home has enough food to get through that period of time. However, as a prepper, it is always smart to hope for the best and prepare for the worst. 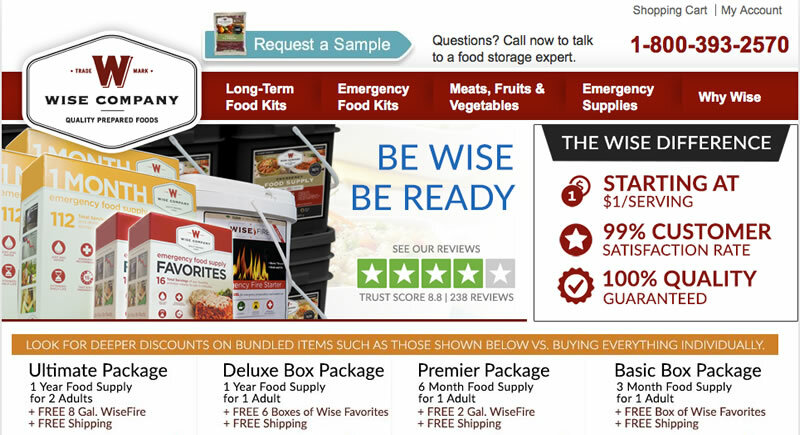 Wise Food Storage offers long-term emergency food supply products of 6 and 12 months, and those offerings are what are reviewed here. 672 total servings of entrées, sides and drinks. This particular offering is a nice entry-level price point that provides a convenient one-stop solution for 6 months of emergency food. Also, families can purchase 1 of these products as needed, until all the members of the family are covered. With your purchase you receive free shipping and 16 free servings of Wise food favorites, including 4 servings each of Creamy Pasta & Veg Rotini, Tomato Basil Soup, Savory Stroganoff and Cheesy Lasagna. Just over $1 per serving, 25 year shelf life. This is the perfect package for several emergency food supply situations. One individual could live off of this package for 1 year. 2 adults or 1 adult and 2 children could also get their daily caloric requirements with this package. Some of the meals included are Cheesy Macaroni, Creamy Pasta and Vegetable Rotini, Loaded Baked Potato Casserole, Pasta Alfredo and Strawberry Granola Crunch. $2 per serving, 25 year shelf life. This is perfect if you are looking for lower sodium and trans fat content. Wise developed this package to last 2 adults 6 months, 1 adult and 2 children 6 months or the equivalent thereof. Wise had this package specifically made with less salt and lower fat. Southwest Beans and Rice, Teriyaki and Rice, Chili Macaroni and Chicken Flavored Noodle Soup are some common entrées included. Just over $2 per serving, 25 year shelf life. This is also another low sodium and low trans fat package. 720 entrées and 720 breakfast servings are included. The same delicious entrées as in the previous 2 packages are present here. This serves as enough emergency food for a disaster situation for 4 adults, or 2 adults and 4 children. Just under $2 per serving, 25 year shelf life. Again, lower sodium and trans fat. (Could also serve 2 adults for 1 year). This six-month emergency food supply gets 4 adults 3 meals a day for 6 months., Or 2 adults and 4 children. Meal items are the same as above. Just under $2 per serving, 25 year shelf life. This Best Value package includes 2 of the six-month supplies for one person, free shipping, and 16 free servings of Wise food customer favorites. Less than $1 per serving, 25 year shelf life. A 1 year emergency food supply for 1 person, or 6 months for 2 adults. Just over $2 per serving, 25 year shelf life. Low sodium and low trans fat, 1 year’s worth of survival food for 1 person. Barely over $2 per serving, 25 year shelf life. Another low trans fat, low salt product. 2 disaster survivors can last 1 year on this supply, at 2 meals per day. Just under $2 per serving, 25 year shelf life. This low-fat, low-salt package is ideal for 2 adults or 1 adult and 2 children, enjoying 3 servings per day. A little under $2 per serving, 25 year shelf life. A Best Value long-term solution for 4 adults or 2 adults and 4 children. All meals are lower sodium, lower trans fat, just $1.70 per serving, 25 year shelf life. At $1.62 per serving, this Best Value 3 servings per day, 1 year emergency food supply fees 4 adults or 2 adults and 4 children. 25 year shelf life, lower sodium and trans fat. Wise long-term disaster food supply products are priced at around $1 to just over $2 per serving. The food quality is excellent. This is due to the fact that Wise actually manufactures much of its own food products. Quality is guaranteed, as these long-term food supplies are made in the USA. The company has total oversight over what foods are used in the manufacturing process, and this guarantees a high quality product. In the prepper and survivalist communities, as well as in the camping and hiking marketplaces, Wise foods are known as long-lasting, low cost per serving meals that are actually delicious. We agree. When Wise entered the emergency food supply industry, they innovated the mylar pouch storage design. This makes using their products very easy. You just add water, and in some cases heat that product, and you are eating. Also, Wise was one of the first disaster food manufacturers to employ a square, stackable bucket design. This minimizes your food storage space, which is another big plus. For long-term emergency food, Wise offers “Made in the USA” value and quality. Someone getting started on a limited budget can begin with the 1 person six-month supply, enjoy free shipping and bonus food, and is still only looking at about $1 per serving. If you are concerned about salt content and trans fat, and you should be, the company offers long-term solutions with those characteristics at around $2 per serving. 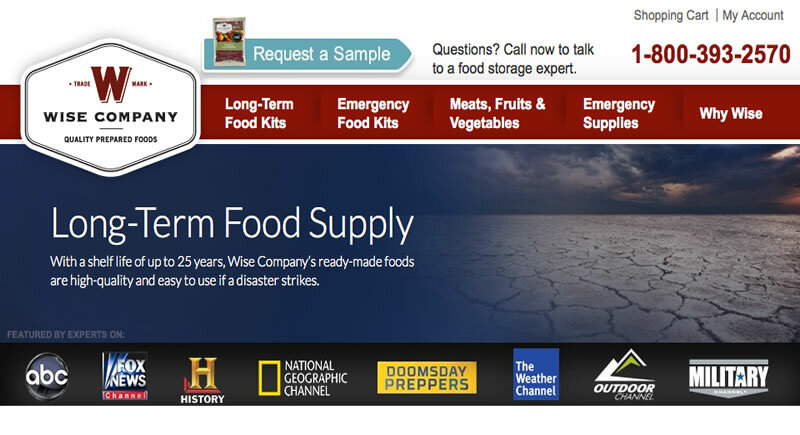 It is our belief, and that of many serious survivalists, outdoorsmen and preppers that have freely post their opinions online, that Wise Food Storage offers an intelligent and affordable long-term emergency food solution.